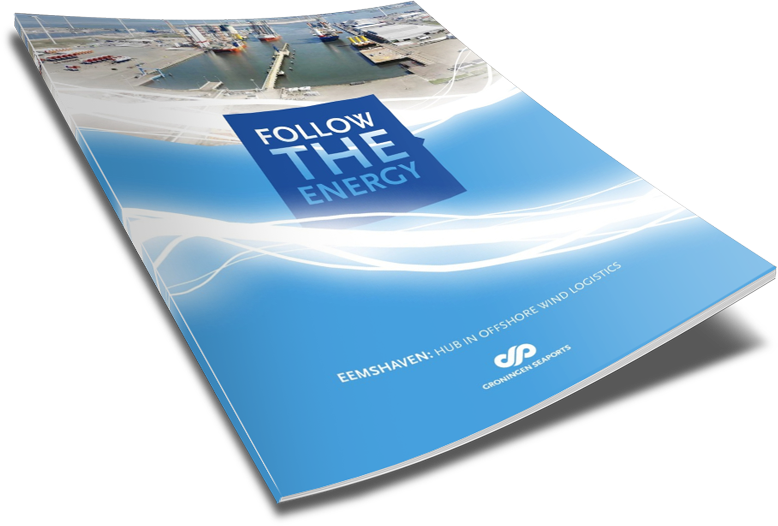 Eemshaven: base, marshalling and service port for offshore wind logistics! 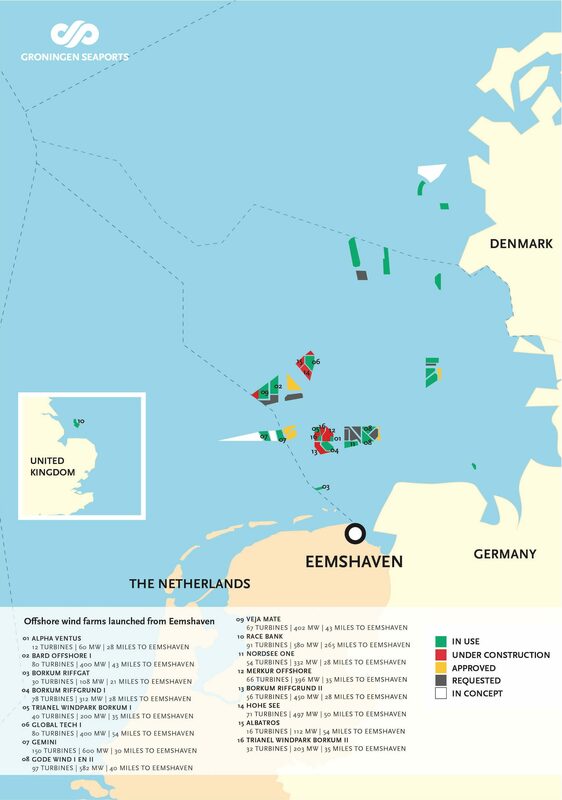 Major energy producers have invested billions of Euros in new power stations; an oil terminal was built; Google is expanding its immense data centre; and Eemshaven houses the largest onshore wind park in the Netherlands. The port also plays a prominent role in the development of wind parks at sea during their construction and the subsequent maintenance of the wind turbines. Eemshaven lives and breathes offshore wind. The port has become a base, marshalling and service port for offshore windfarms especially in the German neighbouring part of the North Sea. Eemshaven is geographically well-situated for the offshore wind activities in the North Sea. Moreover, Eemshaven meets all maritime requirements and has the facilities regarding the assembly and shipping of wind turbines. Since 2009 Eemshaven plays an important role regarding assembly and shipping activities of wind turbines, which results in an impressive track record of wind farms launched from Eemshaven: successively Alpha Ventus, Bard Offshore I, Borkum Riffgat, Borkum Riffgrund I, Trianel Windpark Borkum I, Global Tech I, Gemini, Gode Wind I & II, Veja Mate, Race Bank (UK), Nordsee One, Merkur Offshore and Borkum Riffgrund II. Soon the wind farm Hohe See will be launched from Eemshaven to be followed by Albatros and Trianel Windpark Borkum II. For the Trianel wind farm planning, transport, storage and pre-assembly of the wind turbine components will take place, which means that the entire above-water part of the wind turbines is to be supplied from Eemshaven. In the near future many offshore wind projects in which Eemshaven could fit as base or service port are planned. The profile of Eemshaven answers to be a service port for activities regarding the operations and maintenance (O&M) of offshore wind turbines. Both Emmahaven and Beatrixhaven are suitable to accommodate these kind of activities. There are sufficient berthing places for small and medium sized vessels and it is possible to embark passengers. With connections for power supply and fresh water, storage possibilities, office space, customs clearance, and the presence of several logistic providers Eemshaven meets all requirements to accommodate maintenance and service companies. Eemshaven already is the service base for the wind farms Gemini (150 turbines), Veja Mate (67 turbines) and Merkur Offshore (66 turbines). Specialized stevedoring companies have been established in Eemshaven like BOW Terminal, Buss Terminal Eemshaven, Sealane, Wagenborg and Wijnne Barends. They all offer quay facilities and handle logistic activities and have lots of experience in offshore wind business. Amasus Shipping and EMS Maritime Offshore also provide logistic services and offer for instance jetty capacity. In recent years, not only has Eemshaven grown into an important base port for offshore wind logistics, it has also increasingly developed into a service port for the maintenance of installed offshore wind turbines. Eemshaven is already the maintenance base for the Gemini, Veja Mate and Merkur Offshore wind farms (273 turbines in total) and in view of its location, the presence of the entire supply chain and the potential of many more planned wind turbines in the North Sea, Eemshaven is expected to further strengthen its strong position as a base and service port. The presence of a heliport makes Eemshaven an even more attractive option. The owners of the large modern wind farms use both ships and helicopters for the necessary service and maintenance work. The choice for ship or helicopter depends on weather conditions, distance, urgency, amount of material, etc. Heliport Eemshaven is primarily aimed at facilitating helicopter flights for the offshore wind industry, but can also be used for ambulance and trauma flights and, for example, for piloting ships. Flights are only operated in daylight, it is for helicopters only. 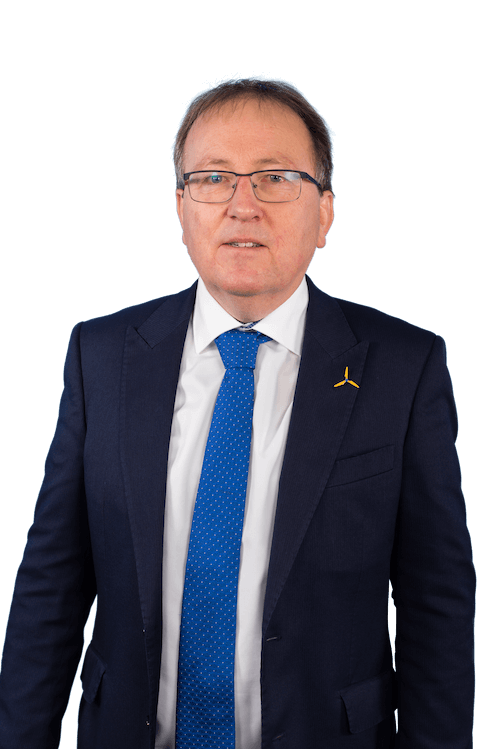 The location will mainly be used by helicopters (usually 8-10 persons) flying to the offshore wind farms. The heliport has an obstacle-free zone on two sides for the approach and departure routes, whereby the flight routes are as close as possible to the existing shipping lanes.